What would compel 4,000 smart people to travel to Texas in August, only to braise in 40° C (105° F, y’all), full humidity heat for an entire week? Well, if you are an engineering enthusiast (AKA nerd) like me, you are attending NIWeek in Austin. Every year, on meteorologically the worst possible week of the year, our friends at National Instruments (NI) host a celebration of technology, and engineering heroism unlike any other event in the world. As per usual, Team Quanser was there to share in the fun. NIWeek has become the event where Quanser engineers truly strut our stuff… our digital dazzle… scientific sassy… mechatronic mojo. Not so much for some well-thought-out marketing rationale to clearly demonstrate the core benefits of our solutions, but because it’s the one time of the year where the engineers are unashamedly engineers… builders, explorers, rascals, tinkerers. 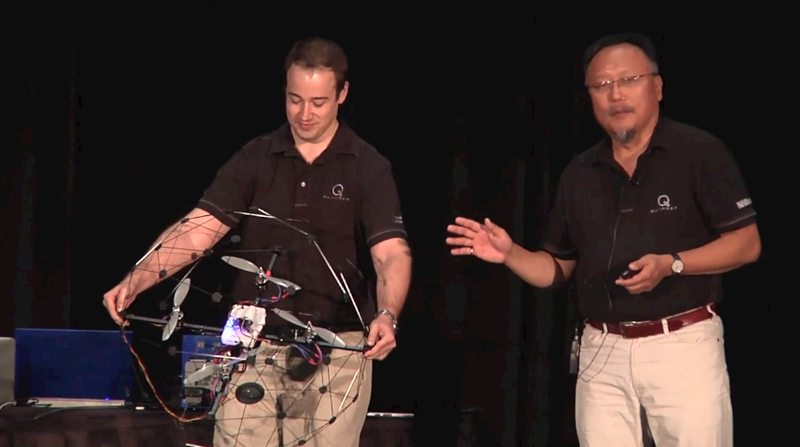 Cameron Fulford, Engineering Manager, and Tom Lee, Chief Education Officer, both of Quanser, prepare to fly the Qball X-4 quadrotor, Quanser’s flagship UAV platform, with the newly introduced NI myRIO embedded hardware device. This year, we sure did have fun. One of the key highlights of the conference for NI was the launch of their latest (and truly sick) product, the NI myRIO, a richly featured embedded computing platform that is pointed directly at students who are itching to break away from their desktop chains and make mobile magic happen. Unlike other hobby platforms, the myRIO is a true NI solution with all of the robustness and support software features that will make the difference between real engineering and hacking for students. Quanser was one of the few privileged groups to get a prototype unit well ahead of launch so that we could get a head start on integration into our product line and maybe even develop a couple of demos in time for the launch. So a sensible company would have used this opportunity to create interesting demos on how the myRIO, when combined with our devices, can offer richer educational experiences. NIWEEK is one of the world’s most important engineering conferences. This year’s event featured the launch of the revolutionary NI myRIO device, a richly featured embedded computing platform that allows students to work outside the lab to design real projects quickly. What did we do? We strapped it on to our flagship unmanned aerial vehicle (UAV) platform, the Qball X4 quadrotor, and flew it around the conference, generally delighting people with the sheer cool factor and occasionally annoying people with the ear-assaulting hum of the Qball’s research-grade motors. The Qball is one of Quanser’s most celebrated research platforms. Bleeding edge research groups around the world to validate complex algorithms for multi-agent unmanned vehicle experiments (i.e. intelligent, collaborative robots). Unfortunately, prior to this year, there really was no practical way to have the Qball work on the NI platform simply because there was no embedded platform capable and rich enough to do all the things that the Qball does… until the myRIO. The end result, as we say in Canada was, “beauty eh?” It was truly impressive. Not just the fact that the Qball, powered by myRIO, flew crisply and in a well-controlled way, but the actual integration process was surprisingly smooth. As we illustrated during our demo at the keynote, the work that NI has invested in a full range of multitalented express VI’s for a whole range of essential subsystems and functions reduced the development effort to a matter of days. We had been bracing ourselves for an effort of weeks (the UAV applications are some of the trickiest) but thankfully we were proven wrong. So where do we go from here? When can you buy a Qball V2.0 powered by NI myRIO? When can you feel and breathe the magic yourself? We have no idea. The reality is the Qball is an entire platform with options for optical tracking, and a wide range of experimental applications. It’s so much more than just getting it to fly. It’s also not exactly the kind of product that people buy for use by undergrads. But in the end, I think this was an amazing illustration of the true power and potential of the myRIO platform. Specs aside, it really brought out the kid among our engineering team and got us to be more creative and ambitious. It was an exciting project. It was a fun project. Thankfully, it was not as hard as we thought. And in the end, it was the right thing to do. P.S. I wasn’t totally honest. We actually did do a sensible myRIO thing as well. We announced and demonstrated the upcoming Quanser Terminal Board (QTB) for NI myRIO, a device that quickly connects the myRIO to most of Quanser’s core plants offering users a terrific, new, cost-effective DAQ option for control systems. Yawn.